Fences for dogs are divided into: electronic fences, which are for use in dogs in common; further on the market electric fencing, similar to those for cattle, but in a weaker version suitable for dogs. These electric fences are suitable only for a minimum number of cases, because it is necessary, after the plot pull cable which is energized (unlike electronic wherein leads insulated wire along the fence or in the ground). The last category are wireless fences that do not require wire. They send a signal to a specific circuit from which the dog must not move away. It is an ingenious invisible fence that use modern technologies which are safe, proven and reliable. Electronic fences for dogs operate on a simple principle. 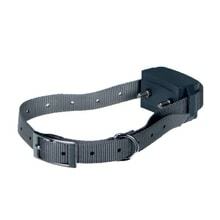 If the dog wears a special collar with a receiver closer to an invisible fence, it is notified that he got to the border, they can not exceed. Note follow generally in several stages: beep, vibration, electrostatic pulse. 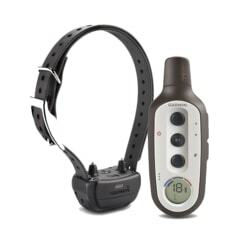 Quality electronic fences and collars from our e-shop will feature a choice of levels of electrostatic correction and other types of alerts. Certainly the issue is not about cruelty to animals. 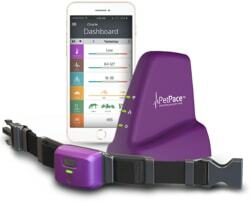 Conversely, the use of an electronic fence in a dog that tends to run, it can save lives. When to buy an electronic fence? Invisible fences for dogs are inspired by the classic electric fences for cattle. Their primary goal is to prevent animals escaping from a demarcated area, which ensures their safety. If your dog regularly runs after other dogs or people, and tends to burrow or look for other loopholes in the fence, get him an electronic fence. Once he gets into the forbidden zone, it gets clear that this way is not the way. The dog is then no need to worry even when you are away from home. We recommend a wireless electronic fences and fences that are safe and reliable. How to choose electronic fence? In addition to the type of invisible fence (electronic fences, wireless fence and electric fence), you can also select by brand. In our e-shop with electronic fences we prepared only invisible fences from proven manufacturers. Electronic fences are tested by ourselves and from our own experience we can recommend especially invisible fences from Petsafe Pet at School, which also belongs to the best-selling brands. 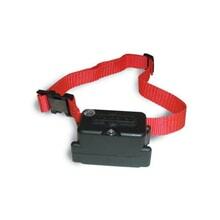 Electronic fence for dogs choose primarily by the size and sensitivity of the dog. Consider offered features, accessories, equipment, range or type of installation. When you are selecting the appropriate electric fence or collar and you are lost, we are ready to give you advice. You can contact us in several ways: Infoline on 721 471 118, emailinfo@elektro-obojky.cz or using online chat in the bottom right corner. Choosing the right electronic fence is important. Every dog is different and suits him something else. Therefore, we have prepared a unique offer! Not only will assist you with the selection of the electronic fence , but you have a whole one month of trial period! Unless the collar is not suitable, replace it! Náhradní přijímač k elektronickému ohradníku iTrainer TP16. 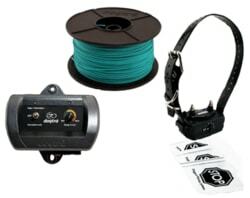 Extra Collar and receiver for fence PetSafe for big dogs. Náhradní přijímač pro ohradník Dogtra EF-3500. Kompatibilní také s jinými ohradníky značky Dogtra. 1What is the electronic fence? Electronic fences for dogs (sometimes inaccurately referred to as an electric fences or an electric fence) is an advanced training aid that is completely safe and correct use with the animal can not hurt them. Electronic invisible fence is popular with customers worldwide. This is a very efficient and aesthetic way to keep the dog in a designated area. Why turn a blind dog in a kennel when he can have a free run. 2How does electronic fence work? It's very simple. Dog wearing a collar, on which is mounted receiver. This is linked with the transmitter. 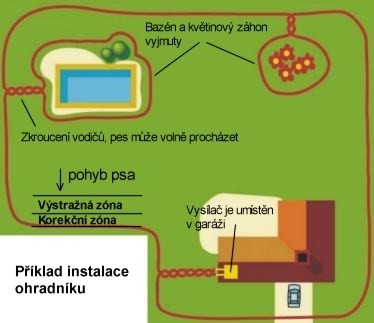 An important part of the electronic fence is an insulated wire that is guided around the property or garden (it can be placed in the ground, stretch it along the fence, etc.). Because this wire is actually invisible - especially when it is incorporated in the ground - electronic fences are also called invisible fences. 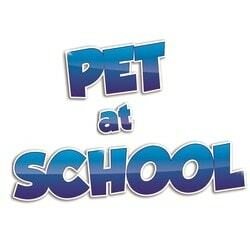 Wire leads a signal, not electricity, so it is really safe for you and the animal. Establishing your space by placing a wire, beyond which the dog could not go. This is of course appropriate to add instructions when he repeatedly shows where cant. 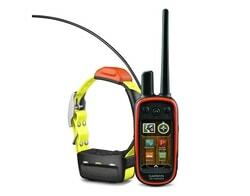 On the transmitter, then you can adjust the length of the zone from the wire, where the dog can go. 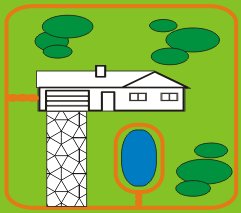 This zone can be set from 30 cm to 10 meters. In practice it works so that when the dog approaches the warning zone (ie, near the border, which must not exceed) gets the first warning by beep. If he would continue to receive a correction pulse. The dog will quickly realize the connection between the sound and electrostatic impulse. So then just audible signal will stop the dog from escaping. 3With what will electronic fence help? 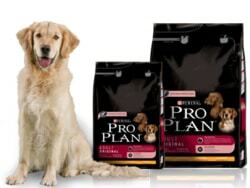 the effective removal of unwanted dogs escaping from gardens or land. Thanks to this dog will not have to be tied or close in a cage or kennel. 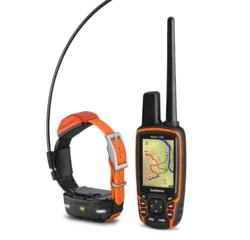 The dog will have more freedom and so it can move freely only in your tracking area. 4 Are electronic fences safe? Electronic collars, fences and hedges went through strict controls and their predecessors have been somewhat controversial, these new are very different. They are safe, their goal is to educate, not punish. On the number of times an electronic fence can save your dogs live when running out of land, runs along the road, or it takes a stampede needed to railroad tracks. But back to your question. It is important to say that the degree of electrostatic pulse can be set at several levels. Therefore, select a level at which the dog will react, but that is not too strong, ie. Should not whine when correction. 5When start using electronic fences? 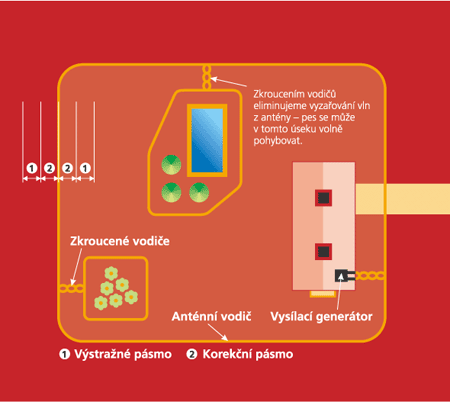 Electronic fences are recommended for use from 6 months (dog learn best, but it is possible popužít earlier). It is important to choose a suitable pulse rate (the dog should react on impulse, on the other hand, should not be for him too painful - like a whimper.). Ideally, therefore we recommend fence where it is possible to change the strength of the pulse. Fencing usually offers various levels of warning (beep, vibrate, pulse). The dog will very soon realize sequence of signals, so then he just beep or vibration and the correction zone already nesvtupuje. 6What function fencing offers and what kind are they? 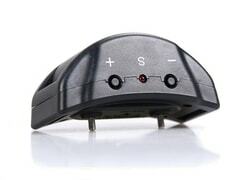 The more practical features electronic fence, the better you will control a dog. The most important and also the most basic functions that would fence should contain the possibility of setting zone (distance from the wires) and possibility set power pulse on the collar. Some fences have the possibility of setting up separate audio zones and distance impulses or cut-off pulse on the collar, etc ..
Invisible fences: The best and easiest way to define space for your dog. Simply, surround the land or part of wire that bury or lay on the ground. 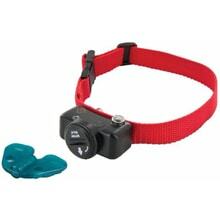 The dog neck has receiver and when approaching the zone is warned with a sound or vibration, and then pulse. Electric fencing: Electric fences are devices that generate coverage not as physical barrier, but through electrical pulses. Fence keeps the animals in defining space using electric discharge sensible pulse, but it does not have the strength to hurt the animal. Wireless fencing: Base sends a signal to a distance of 27.5 meters, a dog can not leave this area. When using a plurality of base area can be indefinitely expanded. 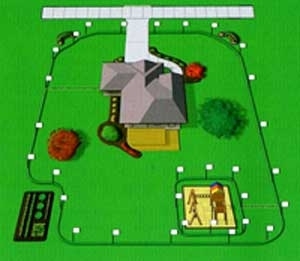 For example, you can put the base in front and behind the hut, thereby covering the entire site and not have to deal stretching and burial wire. Spray fencing: This is a kind of corrective signal when the remedy is using a spray that is sprayed on the dog's nose when he walked into designated zones. It is the second most effective and painless method of correction on the market. 7What is the proper size and the coverage of the fence? In the event that your dog runs from the garden and you are not able to prevent him from this habit. As I said, you had the need to save lives. It's not yet no shame. Among the clients we have experienced cynologists. Electronic fences can also be recommended if the dog is doing mischief in the beds or in the garden. Simply through the electronic fence Establishing your part where the dog can run around and where not. Electronic invisible fence can be used for all types and sizes of land. Mainly depends on the model of the fence. We offer fencing, which are designed to land on the perimeter up to 2 kilometers. 8Are the fences water resistant? Another very important feature is the resistance against water. Most often you encounter these water resistance: Waterproof: Receiver is only resistant to weather conditions (snow, rain) Waterproof: Receiver is weather-resistant and accidental exposure to water spray. Collars are not resistant to immersion. Submergible: Such receivers are resistant to stay in the water, and can therefore generally be used without any limitation. 9What kind of power fences use? Power is a very important factor when choosing and should not be underestimated. 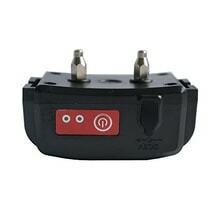 Especially cheaper models of electronic fences are mostly powered by an ordinary 3V, 6V or 9V battery. The price of these batteries is roughly 50 to 150 CZK and it is therefore appropriate to take into account when choosing a fence and running costs, which can reach up to several hundred per year. 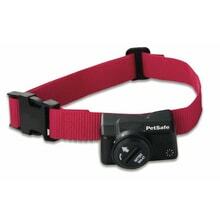 Some collars are even used atypical batteries that bad hustling or batteries supplied by the manufacturer, which can be bought only from the manufacturer or seller of the collar. For this reason, we recommend that rather collars that are powered via built-in battery that recharges easily via a USB cable or a network. 10Is it simple to instal the fence? Installing a fence is not difficult, but definitely take some time. Above all, it depends on whether you will be installing tripping over the wire to the ground (aesthetically), or if you attach it to the fence or leave freely on the ground. If the wire will stumble, be aware that it will take about a day when installing to 400m. The actual involvement of the fence is very simple. Plugging the generator into the broadcast network and from it, take out the wire that you surround the entire lot or only certain parts you need. Then just turn on the generator set your distance and put the collar on the dog. Before putting collar on the dog, we recommend you go through the whole garden with a collar and test test the correct functionality. 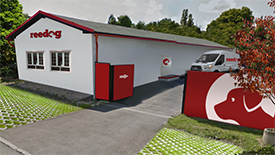 In case the customer does not have time, you can order professional installation, which, however, varies from 2,500 CZK.